I have received a lot of questions about the watch I wear in my workout videos. 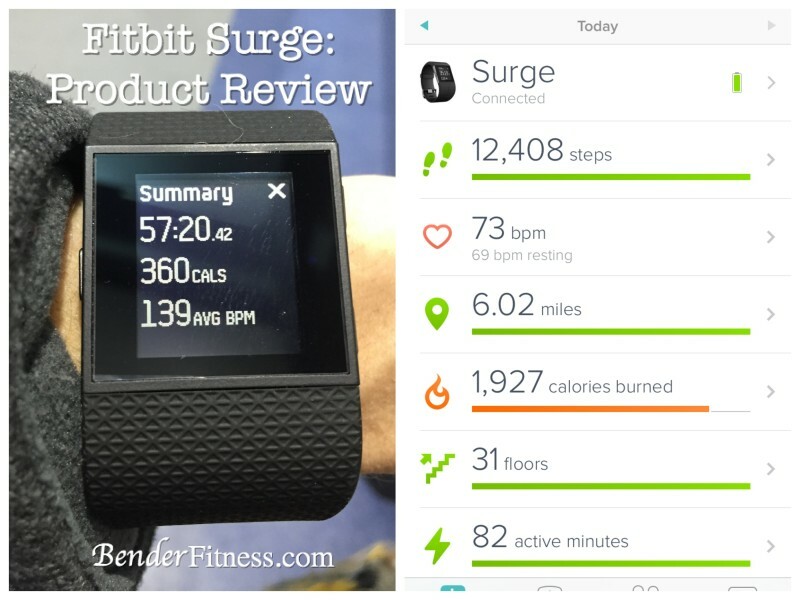 I wanted to take a few minutes to do a Product Review of the Fitbit Surge. This is the watch that I wear in my workout videos to track my heart rate and calories burned. It’s also a GPS watch and pedometer, so I track my steps all day long, and even log/track all of my running right on the device. I am going to talk about what the watch does, Pros & Cons, and Upgrades I would love to see in the future. 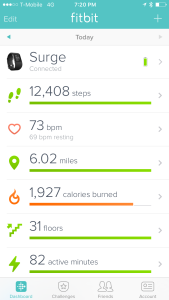 Fitbit has many products that track steps and/or heart rate. I selected this one because it also has the GPS tracking for runs. I was previously using the Garmin Forerunner to track my runs, but I liked the idea of having all of my workouts & daily activity synced in one place for easy tracking. I have been using this product for 3-Months now. I wanted to allow enough time to get used to it and try it in a variety of situations before giving my opinion. I haven’t tried other activity trackers, so I can’t give you a direct comparison, but I can tell you what I like about this product, and what changes I would like to see. So what does this watch do? Pros: I love tracking my steps. I find it very motivating, and it encourages me to get my body moving on days that are slow. If I see that my steps are low, I am motivated to get them higher. That might mean walking up and down my staircase, or getting out for a walk or run. Steps are a quick way to show you how much you are moving & to help you spot trends in your workout activity. Cons: The accuracy of step tracking is dependent on how much you move your arms. If you are walking or running it will track very accurately. If you are pushing a stroller or wheelchair, or carrying something you will not be tracking all of your steps. I am an Occupational Therapist, so I spend a lot of my time pushing wheelchairs of my patients that are too de-conditioned to make the long walk to/from the therapy gym. At work the pedometer on my phone typically says I walk 1000-2000 more steps than my Fitbit reports, because my arm is still while I push a wheelchair. I am currently pregnant, and I plan on running/walking with Baby Bender in a Stroller, so this will impact my tracked steps. Suggested Upgrades: I would love to see an option to add a tracker that can be placed on your sneakers. If I was the designer, I would create a device, much like the small race chips you tie to your shoelaces, that would sync with the phone to track steps even when your arms aren’t swinging. If you know that you are going to be running or walking while pushing a stroller/wheelchair, or doing a lot of carrying, you can place this device on your shoe to sync for a more accurate step count. It’s not something you would need all the time, and it would be a great option for people impacted by this issue. Pros: This device tracks your heart rate directly from the watch band. You don’t have to wear a separate heart rate monitor strap across your chest. This is a big pro for me, because I have gotten friction burns, and rubbed off skin under the chest strap of other heart rate monitors (OUCH!) It also tracks your resting heart rate while sleeping, heart rate during each workout, and helps determine your calories burned during the day. Cons: Occasionally the heart rate has difficulty capturing. The recommendation is to wear the band higher and tighter on the wrist during workouts. Mine seems to be accurate when I compare it to a manual check of my heart rate. My husband has noticed that during runs his heart rate doesn’t always match his rate of perceived exertion, and it seems to be reporting his heart rate on a delay compared to the actual workout. For example, if he is doing a hard interval workout, it might say his heart rate is higher during the “easy” intervals, than during the “hard” intervals. Pros: The watch and app work together to show you not only your total number of hours slept each night, but it also tracks your average each week. 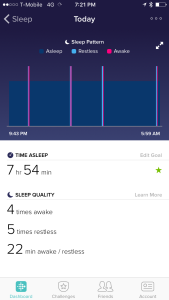 The tracking is based on how much you move while sleeping. If you toss and turn a lot, it will show that you have a lower quality of sleep. When you stay still it shows deeper portions of your sleep cycle. If you get up to use the bathroom or get some water, it will show that you are awake. You can adjust the sensitivity of the watch to be normal or sensitive. Cons: None, just check your sensitivity settings for the most accurate reading. I keep mine on normal, but I am very good at sleeping! Pros: You can add the activities/workouts that you most commonly use directly on your watch. The watch will automatically recognize walking and running after 10 minutes. You can use the GPS option for outdoor workouts such as running, walking, hiking or biking. For indoor workouts you select the workout you want & it will track your heart rate, length of workout and calories burned. You can use your heart rate and calorie burn to directly see how much your effort level will impact your burn. When you sync this into the app it will track all of your workouts, and your Active Minutes over the course of the week. You can easily click on each workout, or go to a specific date to see what your workout/activity level was. Cons: You have to go to the website app to add workouts & sync it to your phone. I was unable to add my desired workouts directly from the watch. For treadmill workouts you may have to adjust your stride length to make sure your readings are accurate. My treadmill workout readings were under by .3 miles (that’s more than one lap around a track!) per mile. For every mile I ran, it said I was only running .7 miles. 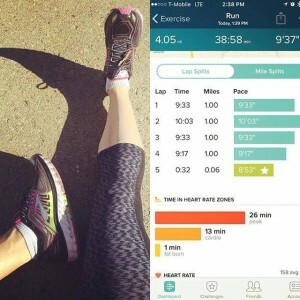 For the Most Accurate Stride Length and Step Readings Follow These Steps: Fitbit Help: Adjusting Stride Length. Pros: The GPS tracking seems to be very accurate. It is comparable to the GPS tracking of my Garmin Forerunner, and clicks the miles off at the same times on my normal running route. Cons: Satellite connection time varies. Before tracking your workout with GPS your watch will link to satellites to track your mileage. Sometimes this happens instantly, other times it can take a couple of minutes. Using the GPS will run down your battery more quickly. Overall, battery life is good, so this isn’t really an issue, but be aware that if you use the GPS option you will have to re-charge your watch more often afterward. Confession: I haven’t actually used this option. I have all of my alarms pre-set on my phone. I will make a point to try this out & update this section of the review. I do know it is a silent alarm, and will vibrate to wake you up or alert you of the time. Pros: You can be notified of new text messages & read them directly from your watch. Cons: It seems like every time I teach a group fitness class I get 15-20 text messages from my boss/co-workers regarding what is on the agenda for the next day. It is very distracting to have your wrist constantly buzzing during your workout, particularly when you know it is work related. I like to focus on my workout with no distractions. You can manage notifications and prevent text messages from going to your watch. Pros: Apparently you can control music/song selection directly from your watch. Cons: I can’t get this to work with my iPhone. When I double click the back button on my watch the music app says “Not Connected.” There are trouble shooting steps for this problem, but I don’t listen to music during the majority of my workouts so it hasn’t been a big issue for me. I will update this section when I go back and re-sync the playlist. Pros: It’s very easy to sync your steps to the app. Just open the app in your phone, make sure bluetooth is enabled, and your steps, sleep, workouts, etc, will be loaded into the app. You can look at your total steps directly in the watch, or on the app. I like having all of my workouts synced and easily referenced in one place. The app is also fun, because you can add friends and join step/activity challenges with them. You will also get “Badges” and “Trophies” for achieving different activity milestones. It is fun and motivating to participate in the challenges with your friends. I also like that this app syncs with MyFitnessPal so you can directly see how may calories you take in and how many you are expending. Cons: I haven’t had any issues with the app or syncing process. Cost: The fitbit surge retails for $249.95. Thank you for leaving a review! I’ve been wondering how the fitbit Surge works. My only question would be your opinion: Would you recommend the Fitbit Surge? Hey! This is a great review, Melissa! I love my Surge! An option that might help you get accurate tracking while at work would be to set up ‘mobile track.’ FitBit then uses your phone as another device and will update steps based off of its reading, might help track better when pushing wheelchairs or strollers. Excellent! I didn’t know about that option! Thank you for the information! Great review, Melissa! Only question/observation–it’s looks HUGE! Does it feel bulky on your wrist, and are you comfortable wearing it all the time? And, I work in an office environment with business attire dress code. I know this is pretty superficial, but can you comment on whether or not it would mesh well with business attire? One last question – could you wear it swimming? Great review, Melissa. I personally found the Blaze to be a little more visually appealing, while offering many of these same features, but both are great!